This log only accounts for a partial selection of the media that I consumed and produced over a period of ten days. Further down is the actual data of my media exposure which has been categorized into different groups (eg. Podcast, Web Browser, Video Games). Jumping into the analysis I must first admit that while I do own a desktop computer, I neither own a smartphone nor a laptop. This makes me apart of the minority of the JOUR1111 cohort , as only 21.2% don't have an internet-enabled smart phone. Not having these technologies also means that I don't use apps and that I don't access to the internet outside of my home and the university computer labs. However, this is not uncommon, because around 90% of the cohort also have access to Wi-Fi at home and at UQ. Overall my media usage and production - with a few exceptions - is pretty atypical of my age group. For instance, I get the majority of my news from the very popular website Mediaite.com. As you can see in the media log above, it is an American blog that covers political and media related news. While this a professional blog that is highly respected as a media source, it is nothing compared to online "newspapers" or TV which 39.4% and 30.9% of the cohort rely on most for their news, respectively. 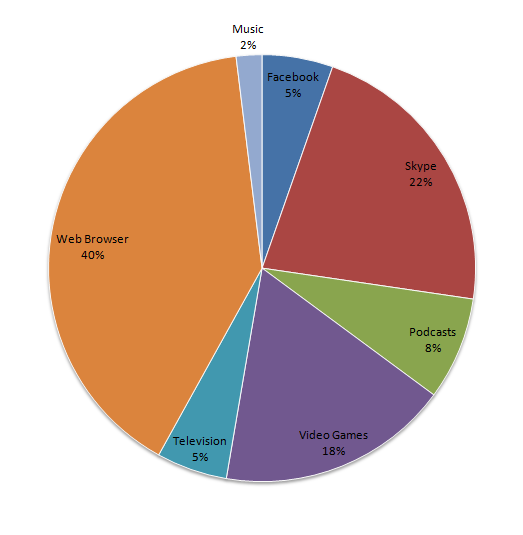 Also noteworthy, is that the largest portion of time I spend connected to the media is through web browsing which adds up to, on average, an astonishing 4.1 hours/day (40%), as you can see in the pie graph above. That makes me one of the 9.1% - a relatively small portion - of the cohort who spend most of their time web browsing and surfing. According to the survey, the most popular online pastime is Facebook with a total of 43%, whilst I only spend 5% of my time on the social network; thus tying with TV watching as the second smallest portion of my media exposure. I, in fact, spend more time listening to podcasts, than being on Facebook. You can see in the media log that I frequent the website Spill.com, which has podcasts focusing on film, video game and geek related news and opinion. A signification portion of my time is devoted to chatting with friends on Skype (22%) and playing video games (18%). These two activities primarily occur simultaneously, as I play the online video games League of Legends and Team Fortress 2 with friends, who I communicate with through Skype. While the survey did not cover online video games, I'm presuming that a moderate percentage of the cohort devotes some leisurely time to them. However, what I do know, is that Skype is very popular among the cohort, as 55.2% use it. Some of my media habits are, of course, consistent with the rest of the cohort. Not at all surprising is that, on average, I watch television for less than 1 hour a day, which is the second largest response of 23.6% to the survey question 'How much TV do you watch most days? (Both broadcast and online)'. In addition I avidly visit the website YouTube, which 93.3% of the cohort also do, and I use the internet for shopping, banking, emailing, studying, and downloading entertainment. In terms of media production, I have been posting content on this student blog with more than just the basic assessment requirements. Since it's creation, I have posted two video game reviews and I am planning to post more in future. For what I've seen the of other blogs, some of my peers are doing the same.